This column shares how teachers use technology for assessment, student learning, or classroom management. Teaching and learning about systems can be challenging without the right tools and curricular supports. 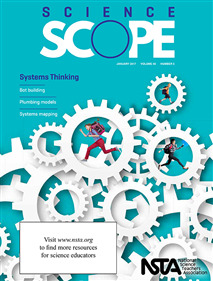 The authors developed a tool to support students in designing and building models of systems that can be tested and revised. Recently, I had a wonderful opportunity to attend a Creative Learning Exchange conference on system thinking in K-12 education, that focused on the importance of teaching the system thinking these days. Since then, I was looking for a tool that would help me to bring some of the basic system thinking principles into classroom. Unfortunately, most of the system thinking tools that I know of are too complicated for younger students. SageModeler, discussed in the article, is a great tool helping to introduce system thinking into upper elementary and middle school.